This question should never have even been asked. We have written here at length about the ridiculous insidiousness of Common Core and its related curriculum, from its absurdly complex and confusing math problems to its sometimes blatant progressive indoctrination on social and religious issues. Yet another example of Common Core was shared with the public recently when the Huffington Post published a picture of student’s homework online. 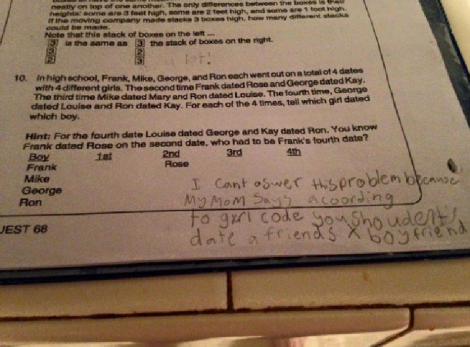 Though HuffPo was focused more on the hilarious response written by the fourth-grade student to a decidedly “inappropriate” math equation, the true nature of Common Core was exposed by the math question itself. Young Maddy Douglas was doing her math homework when she came across a word problem featuring the promiscuous dating habits of a group of high school students. In the scenario, four boys and four girls go on a series of dates with each other, with the student having to figure out who dated whom and in which order. The girl showed her mother the math problem, shocking her and prompting her to go public with the inappropriate question for fourth-graders. The mother was proud of her daughter’s response, and told her she should write that on her homework instead of trying to figure out the problem. “I consider myself to be a completely open-minded type person and as a single mom, try to teach my children about equality and about different types of people they will encounter, but my first reaction was it was not an appropriate question for a fourth-grader or really any grade,” Douglas said.